The 5321 CL SAM (Secure Access Module) from Omnikey is a contactless USB 2.0 PC-linked reader that will read/write to a 13.56 MHz contactless smartcard as well as support additional security through a SIM sized card. 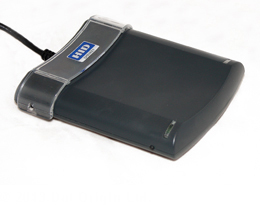 With the additional support of Electro Magnetic Distortion (EMD), users can now benefit by using the device for modern electronic passports and ID cards. The 5321 CL SAM is based on a 13.56 MHz contactless smart card RFID interface that is compliant with ISO specifications 14443 A and B and 15693. The reader works with a variety of 13.56 MHz contactless smart cards including, but not limited to: Philips: MIFARE�, DESFire�, MIFARE ProX�, and iCode; HID: iCLASS�. Texas Instruments: TagIT�. ST Micro: x-ident, SR 176, SR 1X 4K. Infineon: My-d (in secure mode UID only) Atmel: AT088RF020. KSW MicroTech: KSW TempSens. 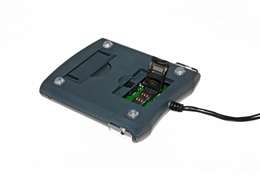 The Omnikey 5321 CL SAM is compatible with Read-a-Card, the contactless card ID reading application, useful for the integration of RFID technology into new or existing systems. Look below for images of the CL SAM version.